Our sales and shipping office is open Monday through Friday from 8:30 am to 5 pm CST. Champion Trailer's current inventory consists of all types of parts for boat, utility, enclosed, and some RV trailers. 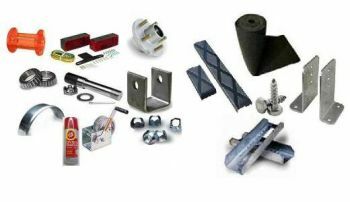 Whether you need springs and axles for your work trailer or waterproof lights and galvanized material for your boat trailer we carry those items in stock. Not only do we carry most all industry standard parts we can special order parts for our customers through our large network of suppliers. In addition to part sales we provide service, repairs, and modifications to all types of light to heavy duty trailers.